The trendsetters over at Food52 recently told me that I could unabashedly pluRonk a whole cauliflower onto my table and call it dinner. Not just any cauliflower, though: it was this one, simmered in a rich, flavorful broth, then roasted on high high heat until the edges were singed, the whole orb a glistening golden. Then I could plunk it on my table and call it dinner. I needed zero convincing to try this one. I will confess, though, that I only had one cauliflower in the fridge, and I was nervous that it wouldn't be enough to feed four of us. Since I'd bought a beautiful fillet of shad the previous day, I decided to roast that alongside the cauliflower. This meant that the cauliflower wasn't our only main dish, but no matter: it was a pièce de résistance all the same. The inner flesh was soft and flavorful from the broth, and those outer bits, well - I could eat them all day long. The sauces didn't hurt, either: one was a whipped feta, made with a bit of yogurt and some softly whipped cream. The other was a savory fig compote, made by heating and steeping dried figs with capers until everything was soft, then blending the mixture until it was smooth. 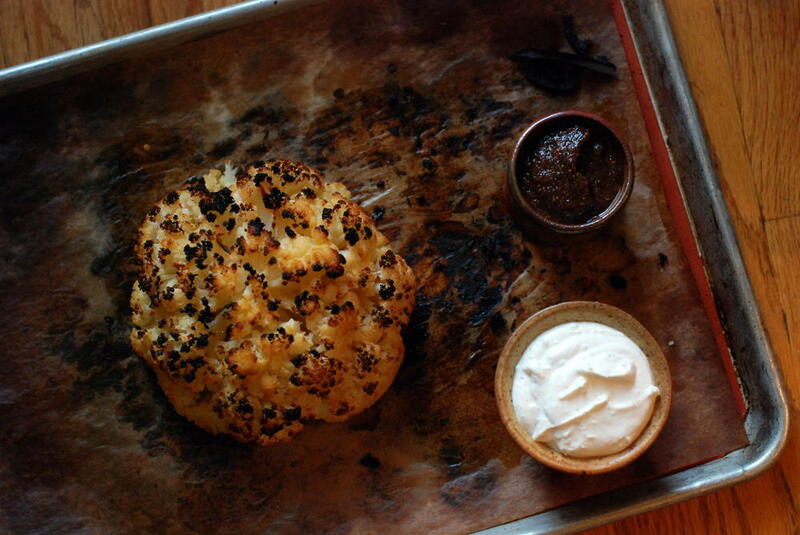 Sweet and briny, it was the perfect compliment to the silky cauliflower. Dinner was simple, but we really enjoyed it. And had we skipped the shad, we wouldn't have missed it. Heat oven to 475° F. Bring wine, oil, salt, lemon juice, red pepper flakes, sugar, bay leaf, and 8 cups water to a boil in a large pot. That broth, by the way? Do not throw it away. It makes a fantastic base for soup and stew, and works like a charm as the cooking liquid for grains. I made some killer wheatberries in it right after removing the cauliflower. Put feta in a medium mixing bowl. Use a fork to mash the feta until mostly smooth (some chunks are okay). In a separate bowl, whip cream until it just barely holds soft peaks. Fold whipped cream and yogurt/sour cream into feta until combined. Bring chai tea and 1/2 cup water to a simmer in a small saucepan. Add figs and capers; simmer 5 minutes. Then remove from heat and let steep 1 hour. Blend cooled mixture using immersion or regular blender until smooth.